The days are getting longer and spring is not too far in the distance. Though it still may feel early, now is the time to start thinking about whether you will sell your home this spring or early summer. A couple of realities never change regardless of when you sell your home, the importance of being prepared and how untimely maintenance surprises will sidetrack or derail your plans. Most potential home sellers focus primarily on the cosmetic elements of their home when preparing for the market, paint touch-ups, carpet repairs and such. However, a buyer’s home inspector is much more interested in the “bones” of your home, beginning with its foundation. Even if you’re not planning to list your home anytime soon, regular foundation inspections and maintenance will eliminate costly, if not catastrophic discoveries when you do decide to sell. Here are some suggestions to consider as we enter the spring season. It’s no surprise that spring remains the best time to sell one’s home, according to statistics provided by Zillow. The dreary days of winter are behind us, the flower beds are blooming with tulips and daffodils, and the sun is lingering much longer through our windows and across our hardwood floors. Houses fetch their highest prices and sell quickest during this period, depending of course on how competitively they are priced and the local housing economy. Homes just carry more curb appeal when the grass is vibrant and the open house window can open longer. As a buyer who wants to imagine what a backyard barbecue would look like when we can see it for ourselves? Plus, spring purchasing makes sense for families because the closing date usually corresponds with the end of school, a much less burdensome transition for all involved. Like the migratory songbirds that arrive each year, Americans think spring is a great time to be on the move. To prepare the seller should start prepping their home in mid-winter to be in the best shape for a spring sale. While it is important to finally replace that missing screw on the kitchen cabinet, our first order of business should include a careful walk around our home to look for any issues affecting our foundation. Fortunately, our home often shows us if it has moved and resettled without our knowing it, beginning with suggestive cracks within the brick veneer of exterior walls, cracks around doorways and windows and/or separation where interior walls and ceilings meet. If you see a crack there’s a good chance a disproportionate amount of weight has settled there, an indication of a foundation issue in need of repair. Family owned and operated since 2002, Carolina Foundation Solutions offers free inspection service for inside and outside your home. 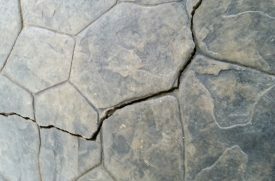 Cracks may be the most obvious symptom but they are hardly the only indication your foundation has shifted or may still be moving. Doors and windows that fail to open or close properly offer a subtle, though no less important, indication the walls in your home have moved. Inspectors will open and shut windows and look at how flush the doors open and close. Even a window or door that sticks may indicate a weak foundation. Any one of these changes demand immediate attention, especially if you are planning to put your home on the market this spring or summer. However, such settling doesn’t mean you have to dig out your basement and throw your house up on jacks to replace your foundation completely. Companies like Carolina Foundation Solutions offer state-of-the-art technology that can often stabilize your home without major physical or financial upheaval. Even if your walls are crack-free there remains important preventative steps to take during winter to preserve this integrity. First, keep your foundation as dry as possible, making sure that rainwater and melting snow runs away from the side of your house. Of course, clear gutters are a key to preventing water damage also. However, rain’s route is only one important area of water damage prevention outside our homes. The grade of your yard, hardscape like patios and driveways should all tilt away from the foundation of your home. It is also important to to confirm there are no errant plumbing leaks that could damage your home and/or its foundation. The owner’s awareness of his or her home’s flaws promises critical information to ensure he or she receives the top possible price when selling a home. An inspector’s discovery of a faulty foundation could significantly depreciate a home’s value, delay the closing or even kill the sale. As potential homeowners this also makes plenty of sense, in fact wouldn’t you expect full compensation for the maximum repair possible should a cracked or shifting foundation be found. In the narrow house sale window this cost may far exceed the actual solution. 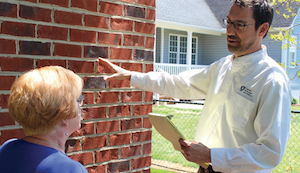 In the Carolinas, Carolina Foundation Solutions will assess your home thoroughly for cracks and other foundation issues. Should there be a problem, a CFS technician will walk you through exactly how to fix this problem. With a clean inspection or appropriate repair behind you, you can focus on getting those tulips into the ground and finally painting that chipped cupboard to make your home shine on the housing market. Visit or call Carolina Foundation Solutions to learn exactly how you can relax, knowing your foundation is solid for a spring or early summer home sale.